I love a faux fur jacket. I've been known to own an excessive amount of faux fur coats and although I began to cut them down by selling a few on eBay, I've started to build up the count once again. I actually went onto ASOS the other night to spend a voucher I had on a pair of trainers, but then this pastel rainbow sensation caught my eye. Needless to say the trainers were left behind (maybe next month!). 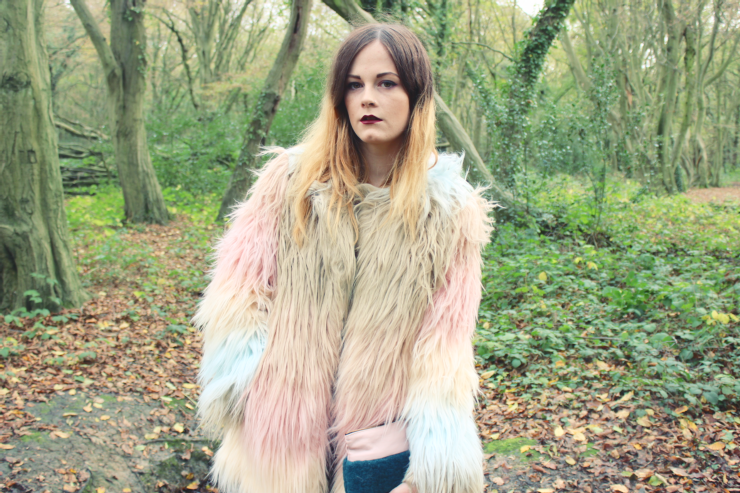 This colourful little clutch from the latest independent accessories brand on the block, Bambie and Butler, just so happens to go hand-in-hand with my faux fur jacket. The clutch is made from the softest leather and compliments any outfit. It's definitely one to go on the top of your Christmas wishlist! I've been searching for a pair of bell bottoms that do not cost the price of my food allowance for the month for quite a while. I don't know who told the sellers of Depop that they should sell what is essentially a flared pair of leggings for £50 +, but I've refused to pay out that much. I was recently in Forever 21 and noticed this black, ribbed, velvet pair for just £17. Now, I'm just hoping they release more colours - purple would be divine! Love this look! Your'e killing it!